The Garrett County commissioners approved several amendments to the county’s Floodplain Management Ordinance following a public hearing Tuesday afternoon at the courthouse. Director Jim Torrington, permits and inspections office, explained why one of the changes was necessary. “In November 2016, we received notice from the Federal Emergency Management Agency of the requirement to update our flood management ordinance to restrict the limit of accessory structures in the 100-year-flood plain to 600 square feet or less,” he said. Torrington described that type of building as something that is an accessory to the principal structure that is on the property. Accessories are sheds, garages, outbuildings etc. “The memorandum basically said if we have a change to our flood study, an update to our flood mapping or a change in federal regulations, we were required then to go ahead and amend our ordinance,” he said about the FEMA notice. The last updates to the county’s ordinance were made in 2013. 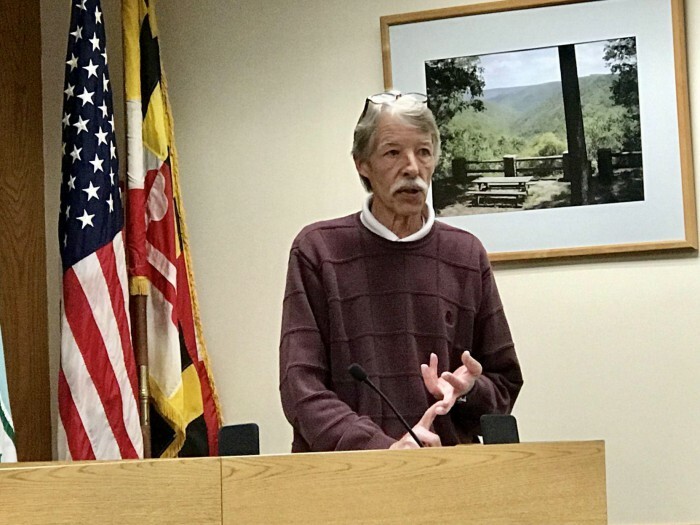 In January 2017, Torrington explained, the county received notice of pending flood mapping changes for the North Branch of the Potomac River in the vicinity of Bayard, West Virginia. The county, therefore, would need to amend its ordinance. The new map will be published on Feb. 1. “It’s a detailed study, meaning that the federal government has calculated the heights and elevations of the 100-year flood,” the director said. The county’s amended ordinance also goes into effect on Feb. 1. In addition to the 600-square-foot limit for accessory structures, the commissioners also approved updates to the definition of historical structures, a map revision, an increase to the elevation requirement for all new structures in the floodplain from one foot to two feet and a change to the flood administrator position. “I’ll be retiring,” said Torrington, who is the current administrator. Effective Feb. 1, Gary Aronhalt, watershed coordinator for the Garrett County Department of Planning and Land Management, will be the new flood administrator. Torrington noted the county also administers towns’ flood ordinances. “They, actually, have adopted our ordinance,” he said about the municipalities. The director presented the commissioners a letter from the mayors endorsing the county ordinance changes. “To date, I have not received any other comments concerning the amendments,” Torrington said. County Administrator Kevin Null stressed the 100-year floodplain only pertains to a small portion of the county. The commissioners’ next public meeting is scheduled Feb. 4 at 4 p.m.